The Quba Mosque (Quba’ Masjid or Masjid al-Quba, Arabic: مسجد قباء), in the outlying environs of Medina in Saudi Arabia, is one of the oldest mosques in the world. Its first stones were positioned by the Islamic prophet Muhammad as soon as he arrived on his emigration from the city of Mecca to Medina and the mosque was completed by his companions. Muhammad spent more than 20 nights in this mosque (after migrating) praying qasr (a short prayer) while waiting for Ali whose house was behind this mosque. According to Islamic tradition, offering two rakaʿāt of nafl prayers in the Quba Mosque is equal to performing one Umrah. Muhammad used to go there, riding or on foot, every Saturday and offer a two rak’ah prayer. He advised others to do the same, saying, “Whoever makes ablutions at home and then goes and prays in the Mosque of Quba, he will have a reward like that of an ‘Umrah.” This hadith is reported by Ahmad ibn Hanbal, Al-Nasa’i, Ibn Majah and Hakim al-Nishaburi. Al-Masjid al-Nabawī (Arabic: المسجد النبوي‎), often called the Prophet’s Mosque, is a mosque built by the Islamic prophet Muhammad situated in the city of Medina. It is the second holiest site in Islam (the first being the Masjid al-Haram in Mecca). It was the second mosque built in history and is now one of the largest mosques in the world. After an expansion during the reign of al-Walid I, it also now incorporates the site of the final resting place of Muhammad and early Muslim leaders Abu Bakr and Umar. The site was originally adjacent to Muhammad’s house; he settled there after his Hijra (emigration) to Medina in 622. He shared in the heavy work of construction. The original mosque was an open-air building. The basic plan of the building has been adopted in the building of other mosques throughout the world. The mosque also served as a community center, a court, and a religious school. There was a raised platform for the people who taught the Quran. Subsequent Islamic rulers greatly expanded and decorated it. In 1909, it became the first place in the Arabian Peninsula to be provided with electrical lights. The mosque is under the control of the Custodian of the Two Holy Mosques. One of the most notable features of the site is the Green Dome in the south-east corner of the mosque,originally Aisha’s house, where the tomb of Muhammad is located. In 1279, a wooden cupola was built over the tomb which was later rebuilt and renovated multiple times in late 15th century and once in 1817. The dome was first painted green in 1837, and later became known as the Green Dome. The mosque is located in what was traditionally the center of Medina, with many hotels and old markets nearby. It is a major pilgrimage site. Many pilgrims who perform the Hajj go on to Medina to visit the mosque due to its connections to the life of Muhammad. The mosque is open for service all day, all year round. Al-Masjid Al-Haram or Masjidil Haram (Arabic: المسجد الحرام‎, The Sacred Mosque or The Grand Mosque) is in the city of Mecca, Saudi Arabia. It is the largest mosque in the world and surrounds one of Islam’s holiest places, the Kaaba. Muslims face in the direction of the Kaaba while performing Salat. One of the Five Pillars of Islam requires every Muslim to perform the Hajj pilgrimage at least once in his or her lifetime if able to do so, including circumambulation of the Kaaba. The current structure covers an area of 356,800 square metres (88.2 acres) including the outdoor and indoor praying spaces and can accommodate up to two million worshipers during the Hajj period, one of the largest annual gatherings of people in the world. Unlike many other mosques which are segregated, men and women can worship at Al-Masjid Al-Haram together. Al-Aqsa Mosque (Arabic:المسجد الاقصى “the Farthest Mosque”) also known as Al-Aqsa and Bayt al-Muqaddas, is the third holiest site in Islam and is located in the Old City of Jerusalem. 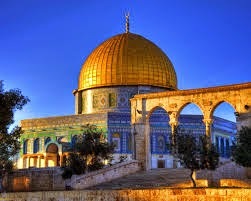 The site on which the silver domed mosque sits, along with the Dome of the Rock, also referred to as al-Haram ash-Sharif (“the Noble Sanctuary”), is the Temple Mount, the holiest site in Judaism, the place where the Temple stood before being destroyed by the Romans in 70 CE. Muslims believe that Muhammad was transported from the Sacred Mosque in Mecca to al-Aqsa during the Night Journey. Islamic tradition holds that Muhammad led prayers towards this site until the seventeenth month after the emigration, when God directed him to turn towards the Kaaba. The mosque was originally a small prayer house built by the Rashidun caliph Umar, but was rebuilt and expanded by the Umayyad caliph Abd al-Malik and finished by his son al-Walid in 705 CE. After an earthquake in 746, the mosque was completely destroyed and rebuilt by the Abbasid caliph al-Mansur in 754, and again rebuilt by his successor al-Mahdi in 780. Another earthquake destroyed most of al-Aqsa in 1033, but two years later the Fatimid caliph Ali az-Zahir built another mosque which has stood to the present-day. During the periodic renovations undertaken, the various ruling dynasties of the Islamic Caliphate constructed additions to the mosque and its precincts, such as its dome, facade, its minbar, minarets and the interior structure. When the Crusaders captured Jerusalem in 1099, they used the mosque as a palace and church, but its function as a mosque was restored after its recapture by Saladin in 1187. More renovations, repairs and additions were undertaken in the later centuries by the Ayyubids, Mamluks, Ottomans, the Supreme Muslim Council, and Jordan. Today, the Old City is under Israeli control, but the mosque remains under the administration of the Jordanian/Palestinian-led Islamic waqf. The Umayyad Mosque, also known as the Great Mosque of Damascus (Arabic: جامع بني أمية الكبير‎, Romanization: Ğāmi’ Banī ‘Umayya al-Kabīr), located in the old city of Damascus, is one of the largest and oldest mosques in the world. It is considered by some Muslims to be the fourth-holiest place in Islam.